Just how fast is “faster wireless charging” in iOS 11.2? NOTE: Samsung’s “Fast Charge” charging pad does not have any hard numbers I can find that indicates how much power it will provide. The below findings display a notable change from previous testing of wireless charging I’ve done. I’ll update this article if I can get more information on the tech specs of this charging pad. As you can see from the graph above, the difference between wireless charging on my “fast charge” Samsung charging pad was slight. There is definitely a difference here, and if you’re already using wireless charging (and your pad supports it), then this is an undeniable win. However, if you were hoping that this would make wireless charging catch up to wired then you’re going to be very disappointed. Over the 2 hour test, the iPhone 8 Plus went from zero to 47%. It charged at an incredibly consistent 4% per 10 minutes. Previously I got up to 40% with this same charger after 2 hours, which is a 17% improvement in wireless charging speed. While this is indeed an increase, it’s not the sort of increase that’s going to get you from “wireless charging is too slow” to “I love wireless charging!”. If you have 2 hours to change your phone and there is a 7% difference in the change level, I don’t think that’s a huge deal. Especially when you compare 30 minutes on the charger, I saw literally no change in performance, as it took 30 minutes for the phone to reach 11% charge. 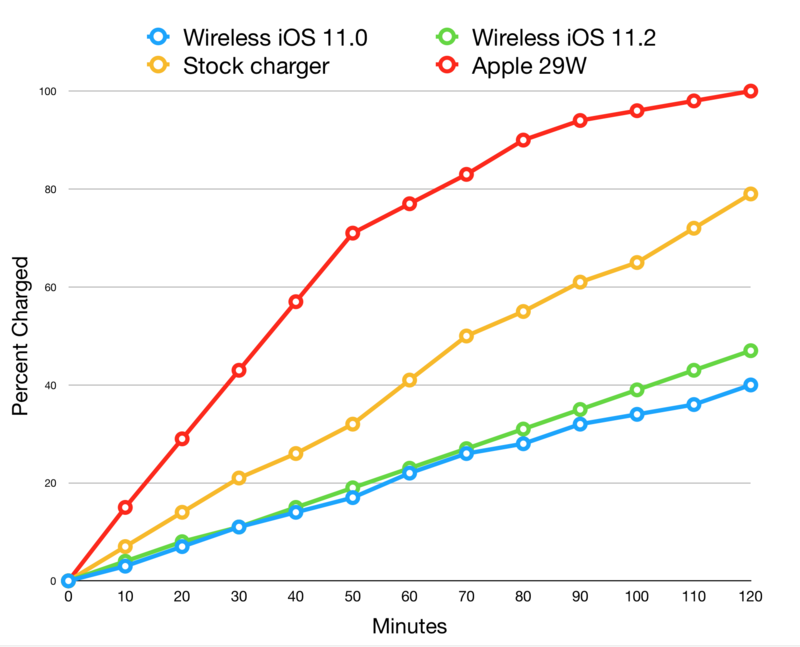 Wired charging remains the fastest way to charge the iPhone in 2017, and it’s not even close. It’s popular to hate on the charger in the box, butthe stock iPhone charger gets the iPhone 8 Plus to 79% in 2 hours (68% faster) and up to 21% at the 30 minute mark (91% faster). That’s a pretty striking difference, and if speed is of the essence, it’s a much better way to get topped up fast. Things get silly when we look at the true fast charging option that Apple has for the new iPhones. The 29W power brick1 and a USB-C to Lightning cable charges the iPhone 8 Plus to 100% in 2 hours (112% faster) and the difference is even more striking at the 30 minute point where this gets the phone to 43% (391% faster). There is absolutely a place for wireless charging and I personally use it all the time. My bedside charger is this Samsung wireless charging pad, and I have a phone stand on my desk at work that charges the phone throughout the day. In both of those situations, trickle charging my phone is totally fine. My phone is always at 100% when I wake up and 100% when I get off of work. But if my phone was at 1% and I was about to get on a plane in 15 minutes, there’s no way I’d use wireless. 15 minutes on a wireless charging pad will get me to 6% and the fast charger will get me to 23%.